MIDDLEBURY, Ind. 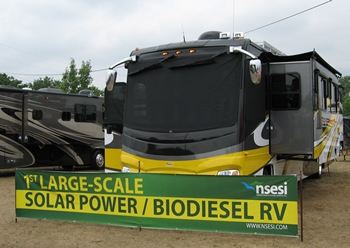 — People attending the recent Coachmen® RV Group owners rally had an opportunity to see a full-size motorhome that is powered by biodiesel fuel and has an electrical system that operates on solar power. They also got to view a Sportscoach® Elite™ diesel Class A that employs a hydrogen generating system to produce a portion of its fuel. These are just two of the examples of how Coachmen RV Group is pursuing "green" technology for the next generation of its RVs. "In a sea of sameness, creative and innovative floorplans and features are a must. But, this traditional innovation is not enough. Our designs must be forward thinking and beyond the conventional limits of creative — they must be environmentally friendly," said Michael R. Terlep, president of Coachmen RV Group. "A focus on green RVs is the right thing to do for the environment and the customer!" Coachmen RV Group recently completed a year-long test of the Sportscoach Elite that was outfitted with a hydrogen generating system developed by Hy-Drive Technologies Ltd. of Mississauga, Ontario. "We are evaluating the data that was collected and will gather input from everyone involved to determine if this particular technology will benefit our customers," said Terlep. The patented Hy-Drive HGS uses electrolysis to produce hydrogen and oxygen from distilled water. A vacuum pump injects the gases into the combustion chamber of the motorhome's engine. The hydrogen-enriched atmosphere in the combustion chamber makes the diesel fuel burn more completely. The burn occurs earlier in the ignition stroke of the piston, producing more power. Another Sportscoach Class A diesel that is decked out with the solar panels is the result of an operating agreement between Coachmen and Natural Source Energy Systems Inc. Coachmen teamed with NSESI in converting the diesel motorhome, an additional Class C motorhome and a fifth wheel trailer to adapt to new state-of-the-art, high efficiency solar panels. In addition to the research being conducted on the use of solar energy, Coachmen and NSESI are conducting research on bio-diesel fuel in diesel-powered motorhomes designed and manufactured by Coachmen. NSESI is a multinational corporation that has been working on developing renewable energy products. Earlier this year, the company began marketing a wide variety of products including photovoltaic cells, solar heat panels, solar water heaters and biodiesel fuels. NSESI also is working with Coachmen RV Group's parent, Coachmen Industries, to develop solar technology for use in structures built by its All American Homes division. "It's important for our industry to become more environmentally conscious. Coachmen intends to be on the leading edge of this movement. However, it's too early to discuss when this technology will go into production," said Terlep. "We want to extensively test these prototypes to ensure we are producing RVs that are environmentally friendly and dependable. Meanwhile, we'll be looking for other opportunities to bring green, efficient, RVer friendly RVs to the market place.